We invite you to celebrate your special event in the in the elegant drawing rooms of the historic Key West Heritage House Museum. 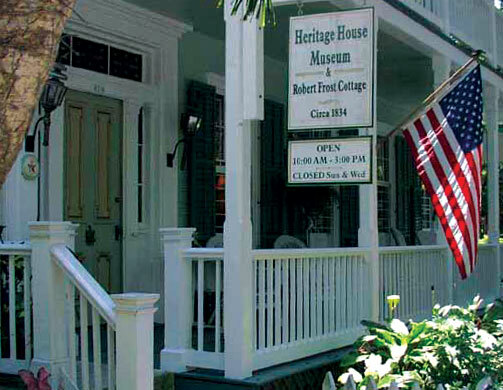 The Key West Heritage House Museum is housed in the historic Capt. George Carey House, the second oldest house in Key West. The classic Caribbean Colonial house is filled with original furnishings, rare antiques and unusual sea faring artifacts collected by seven generations of the Porters, a noted Key West family. Your guests will enjoy the experience of an elegant 19th century home as you exchange your vows in air conditioned comfort. The Key West Heritage House Museum is available for weddings with up to 40 guests. The Heritage House garden, a tropical oasis in the heart of Key West, was once the gathering place for Robert Frost, Tennessee Williams, Gloria Swanson and other Key West celebrities. An 1832 brick hearth provides a natural backdrop for your special event. Towering exotics such as Spanish lime, West Indian Almond, and Gumbo Limbo provide a rich green canopy that filter the sunlight to those below. The soft bubbling of a fountain adds a quiet ambiance that evokes the elegant way of life experienced by many during the early days of Key West. During the evening, sparkling lights illuminate the leafy canopy and add to the festive atmosphere. The garden is ideal for weddings with up to 50 seated guests, for dinner parties of up to 40 people, and receptions for up to 60 people. 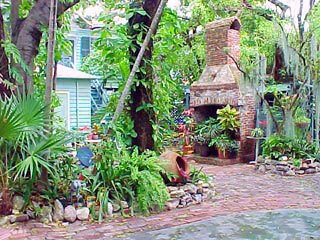 The Heritage House garden is also ideal for corporate groups who want to experience a different aspect of Key West. We look forward to celebrating with you! For more information about reserving our garden or the museum for your special event.